THE TOLBOOTH, Jail Wynd, Broad Street & St John Street – A Townhouse has stood on this site since Stirling was first made a Royal Burgh in the 12th-century. 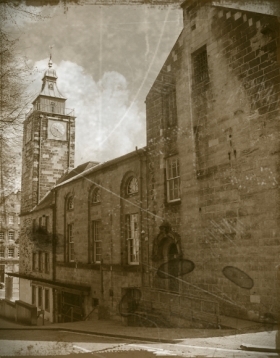 The current building – now the Tolbooth Theatre, Stirling’s venue for music and the arts – is the joining together of three more recent 18th and 19th-century constructions. Stirling’s Courtroom for many years – and the ‘Worst Jail in Britain’, according to a Commission in 1842. The Condemned Cell of the murderous Allan Mair – still said to haunt what is now a theatre - is in the upper right of this photograph.